A “cleat” inspired handle provides a sturdy grip and gives your morning joe a maritime touch. Drinking your morning joe from the bow of a boat? We'd all love that. Bring a touch of nautical charm to your daily routine—wherever you live—with these unique mugs. 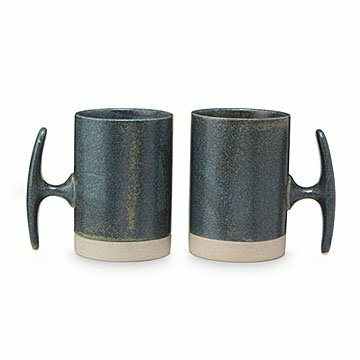 Each stoneware design features a rich seafoam green glaze and clever, easy-to-grip handle that, when tipped on its side, looks exactly like a dock's cleat. A fun gift for sailors or beach lovers, it comes in a set of two so they can enjoy their favorite pick-me-up with a first mate or deckhand. Made in China. I did buy these again!! I bought these as a gift and they loved them so much I ordered six more so they'd have a full set for guests. Everything about them is perfect. I gave these mugs to my brother and his girlfriend who are both sailors and love the water as a Christmas gift. I was happy when I received these mugs for their size and finishing. Unfortunately, the cleat handles did not last more than 2 months of non-daily use before breaking off of BOTH mugs between the site of attachment on the mug and the long part of the cleat. I'm not sure if the pottery is weak, the design is unsupported, or if this is a defective pair, but I'm very disappointed in how these held up. Pretty to look at, apparently not to use. The one I kept for myself was slightly chipped, but not enough to hinder its use. I bought them for our boat-owning children. Only get them if you and your giftee know what a cleat is on a boat. The handle is unique but feels good in my hand. These mugs are quite nice. Good weight, not too heavy. Really cute. These are really well made and really cute. They are larger then I anticipated, which is not a bad thing! My parents are going to love these when they are on their house boat! A long time friend who races kayaks and canoes loved these mugs I sent as a birthday gift recently so much he filled one with morning coffee as he prepared his kayak for a run on the Mississippi River. He told me the cord loosened as the wind picked up and his boat began diverging from the dock side, which if he let it go, would have rushed down the river too fast to grab and probably would have cracked severely from hitting a rock or post. Thinking quick he picked up his new cleat mug, shoved it in a hole in the wood dock and just before the end of the boat cord ran off the dock, grabbed it and tied it quick to the mug cleat. He said he was amazed it held long enough for him to pull the boat back to dockside and tie the other end for safety. Go Nautical Cleat Mugs!